Aug. 19, 2016 – San Diego, CA In an email blast today, the Food and Drug Administration’s Office of Women’s Health ranked Essure as the second-best birth control method in terms of effectiveness after tubal ligation. Essure, the only FDA-approved permanent birth control, was ranked number two on the Office’s updated Birth Control Guide, released today. The guide ranks 18 different birth control methods, ranging from spermicide to sterilization surgery, on their effectiveness based on the number of pregnancies expected per 100 women. 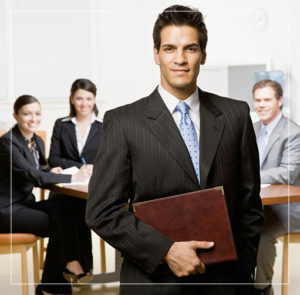 The guide also includes information on some of the methods’ potential risks and side effects. 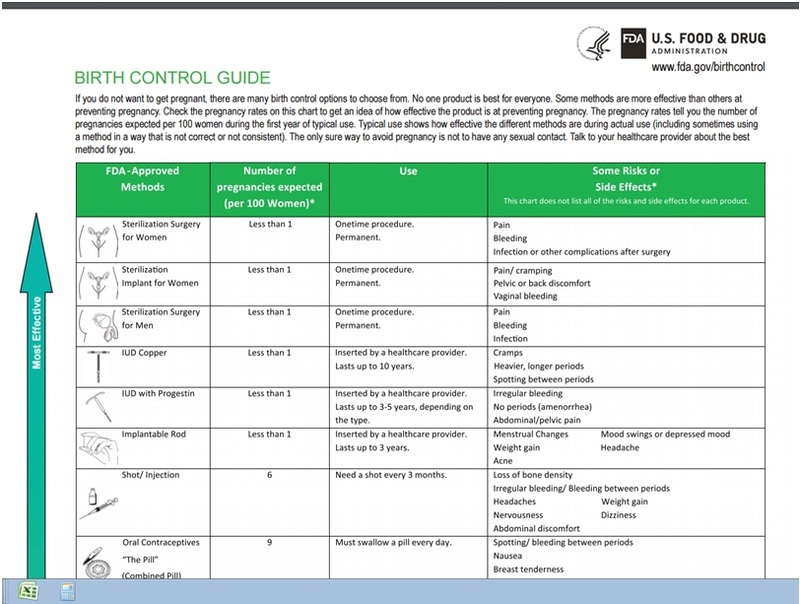 A portion of the FDA’s Birth Control Guide which lists Essure as the second-most effective birth control method available. Bayer Healthcare’s controversial permanent sterilization device Essure was listed as the second-most effective method of birth control on the guide. Sterilization surgery, or tubal ligation, was ranked number one. Both methods were indicated as having less than one pregnancy expected per 100 women. 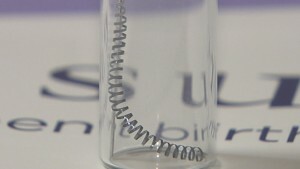 The agency cites a 2011 study published in the journal Contraception as the guide’s source information, despite a more recent study which shows as much as 9.6 percent of women could become pregnant within the first 10 years of getting Essure. The study, published in Contraception in 2014, compared the effectiveness of Essure and traditional tubal ligation and found Essure was less effective than the surgical procedure. Using available published data, researchers calculated the number of expected pregnancies in a hypothetical group of 100,000 women. They estimated 9.6 percent of women who had Essure implanted would get pregnant within 10 years. That number was significantly lower for tubal ligation. Researchers estimated only 2.4 percent to 3 percent of women who underwent tubal ligation would get pregnant within 10 years. Ranking Essure as the second-most effective birth control method also flies in the face of the agency’s own available data. More than 700 reports of pregnancies in women using Essure have been submitted to the FDA, according to the agency. In addition to the device’s regrettable effectiveness rating, Essure’s side effects are not well-represented on the FDA’s Birth Control Guide. Thousands of complaints of serious and life-threatening complications have been lodged by women harmed by the device. These include migration of the device, perforation of nearby organs, and serious allergic reactions and nickel sensitivities. The risk of pregnancy using Essure is also heightened by the fact that the device puts women at a greater risk of ectopic pregnancies compared to other birth control methods. Ectopic pregnancies, which are pregnancies that occur outside of the uterus, can be life-threatening if not treated early. In contrast to these serious side effects, the FDA’s guide merely cites “pain/cramping,” “pelvic or back discomfort” and “vaginal bleeding” as possible side effects. While these are in fact very real and common side effects of Essure, the guide fails to warn against the most-serious possible complications of the device and seems to downplay the side effects it does list. Serious complications are not uncommon among Essure users. According to the FDA’s own information, more than 800 women have reported migration of the device from its original position in the fallopian tubes. Device migration puts women at grater risk for perforation of pelvic organs, such as the uterus. The agency also seems to minimize the potential severity of the side effects it does include in the guide, failing to disclose that the pain and discomfort women experience is often chronic, and that vaginal bleeding can be prolonged, painful and unusually heavy. There are currently three Congressional bills moving through the House of Representatives inspired by Essure, including on that aims to remove the device from the market completely. Since Essure was approved by the FDA in 2002, the agency has reported receiving nearly 10,000 adverse event reports from women harmed by the device. All the while, more than 30,000 E-sisters and their supporters have joined the Facebook group Essure Problems to raise awareness about the controversial device and to support each other on their journeys to become E-free. Yet, in spite of the data, the research and the real-world experience of thousands of women who have had the Essure device implanted, the FDA continues to tout Essure as a safe and effective form of birth control. Click here to read the FDA’s Birth Control Guide. Oprima aqui para leer en espanol.